Q. How can I find an article in an online journal from outside the IOE? 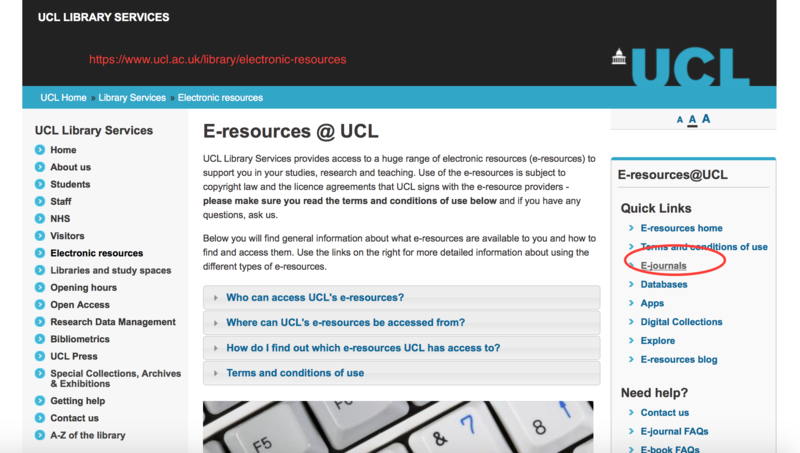 There are various ways of accessing ejournals from outside the UCL Institute of Education. f. Click on the journal title and you will taken to the SFX@UCL page. Click on 'Go' from the list of option (suppliers) and you will then have to sign-on with your UCL username and password. If you do not have these credentials, contact the Computer Helpdesk. g. Once you have authenticated, you will be taken to the journal's website. Select the option to View all volumes and issues on the RH-side of the page; then select the volume and the year, the issue and the page numbers to find the article you require. For additional help, see the IOE LibGuide Accessing Resources Remotely which is a good reference source to bookmark.